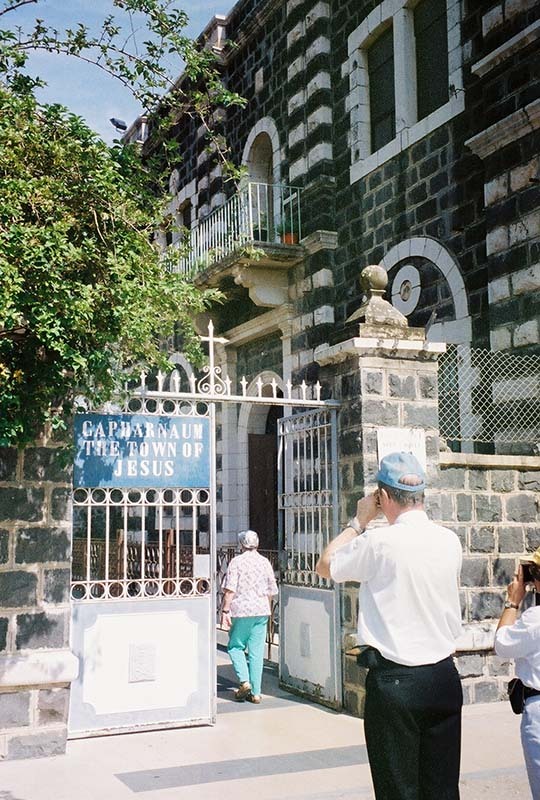 A short distance farther northward along the Sea of Galilee is the modern-day town of Kefar Nahum, and therein are the ruins of the ancient town of Capharnaum (see the similarities in names? ), which we call Capernaum. It was a prosperous town, and Jesus chose it to be His home base after He was rejected from Nazareth because “a prophet is not welcome in his own town.” Jesus chose wisely. Capharnaum was known as the Via Maris, or the Way of the Sea, because it was a significant trade center between land and water. Many, many people passed through, and after they heard Jesus, they told others about Him wherever they went on their trading travels. Click on the sign that Father Ed is taking a picture of.